Real Madrid qualified for the quarter-finals of the Champions League as they beat Roma 2-0 at the Santiago Bernabeu thanks to goals from Cristiano Ronaldo and James Rodriguez. Los Merengues dominated possession from the start and had plenty of chances for scoring. However, the better opportunities of the first half fell to Roma. The visitors should have been ahead after 15 minutes as Salah drove down the right before feeding a low cross into Dzeko, who fired wide under no pressure. 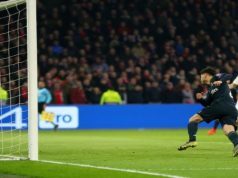 Minutes later, Salah had another wonderful chance as he broke clear once again, but shot wide off the post from a slightly wide angle. Zinedine Zidane men increased their pressure after the break and were close to scoring as Marcelo and Ronaldo both had attempts before James Rodriguez volleyed towards goal, but Szczesny was on hand to make the save. In the next play, Salah once again found himself unmarked inside the Real Madrid box, but his effort again cleared the post. Keylor Navas made two superb saves to deny Florenzi and Manolas from close range, and Roma would regret those errors. Los Blancos finaly took the lead as Ronaldo turned a low Lucas Vasquez cross home from close range, following a brilliant play from the youngster. Four minutes later, James sealed the win in a counter-attack as Ronaldo slid a super pass into the Colombina, who drilled into the bottom corner from close range. 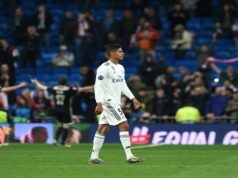 Both teams had chances for scoring more goals, but the goalkeepers did their part to keep the 2-0 score that qualified Real with an aggregate 4-0.